Relatives of passengers of the missing AirAsia Flight 8501 react upon seeing the news on television about the findings of bodies on the waters near the site where the jetliner disappeared in Surabaya, East Java, Indonesia, on Tuesday. 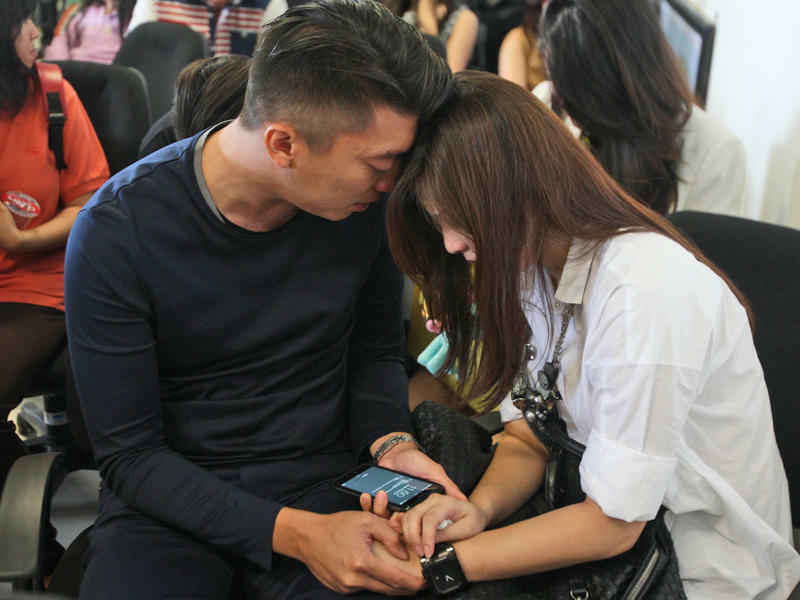 Rescue crews scouring the waters off Indonesia say they have found dozens of bodies and have spotted wreckage that belongs to AirAsia QZ8501, the jetliner that went missing Sunday, carrying 155 passengers and seven crew members.
" 'Based on the navy radio, it has been reported that the warship Bung Tomo has retrieved 40 bodies and the number is growing,' Manahan Simorangkir said. "An Indonesian air force plane spotted items resembling an emergency slide, plane door and other objects in the search for missing AirAsia flight QZ8501 today." In a statement, AirAsia said the National Search and Rescue Agency Republic of Indonesia confirmed the wreckage belonged to the airplane. NBC News reports that Indonesia's president and the head of AirAsia were headed to Surabaya, Indonesia, to meet with relatives. "As grisly images of floating bodies were broadcast on television screens where the families were gathered, relatives sobbed and buried their heads in their hands," NBC News reports. "Some collapsed and required medical treatment." Indonesian President Joko Widodo says the focus for search and rescue teams is now on recovering bodies. Antara News, an Indonesian wire service, reports that Widodo said he had surveyed the debris field himself and saw that the waves were strong and it was foggy. "According to the president, three Indonesian ships are on standby at the site and several others are on their way to locate more debris of QZ8501. "Jokowi further noted that several ships and helicopters will hold massive search operations on Wednesday morning (December 31), as well. "'I have ordered the Basarnas to hold joint operations to find the fuselage, as well as the passengers and crew members,' Jokowi affirmed." Search operations have been suspended for the night for an AirAsia plane with 162 aboard that lost contact with air traffic control after takeoff from Indonesia on a flight to Singapore, the Singapore Civil Aviation Authority reports. 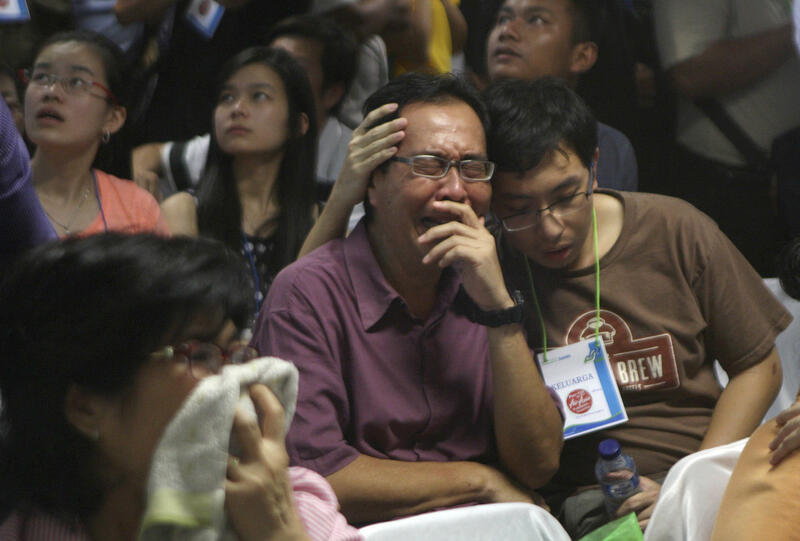 The plane, en route from Surabaya, Indonesia, lost contact about an hour before it was due to arrive in Singapore. It was scheduled to land at 8:30 a.m. Singapore time (7:30 p.m. ET Saturday), Hadi Mustofa, an official with the Indonesian air ministry, said on Indonesia's MetroTV.